Neurologic toxicity related to HiDAC includes gait ataxia, nystagmus, dysmetria, and dysarthria. Seizures and cerebral dysfunction occur, and peripheral neuropathy is rarely described. Signs of cerebellar dysfunction usually emerge between the third and eighth day from start of treatment. In most patients, the symptoms resolve in 3 to 10 days, but in others symptoms persist and can be debilitating or even fatal. The pathophysiology of HiDAC-induced neurotoxicity is poorly understood and the main goal is prevention because there is no effective treatment. Patient with AKI / CKD, or Liver Damage may be at risk of neurological damange. pyridoxine hydrochloride as prophylaxis has no protective effect. removal of cerebrospinal fluid by lumbar puncture as well as methylprednisolone as treatment for symptomatic patients may help. Always examine for horizontal nystagmus, a subtle early sign of the syndrome, as part of a daily comprehensive cerebellar examination. Imaging study are intititally usually normal. localized thrombosis, widespread bleeding, or both can occur hence is termed thrombohemorrhagic syndrome. In large studies, the frequency of symptomatic thrombosis is 5.2%, and of hemorrhage 7%. overexpression of annexin II, which increases plasmin generation by tissue plasminogen activator approximately 60-fold, and elastases from promyelocytes, which cleave fibrinogen and degrade fibrinolytic inhibitors. In addition, secondary fibrinolysis generates thrombin by aberrant tissue factor expression, resulting in tissue plasminogen activator release from the endothelium. In APML, occurs mostly during induction and is almost exclusively intracranial (65%) and pulmonary (32%). transfuse platelets to maintain the level at or more than 50 000/uL for the first several days. transfuse cryoprecipitate, even several times a day, until the fibrinogen is maintained at least 150mg/dL. Early death, usually because of hemorrhage, has emerged as the major cause for treatment failure in APL. Intracranial hemorrhage (ICH) may occur in any thrombocyto- penic patient with acute leukemia but is most common in APL, monocytic leukemia, and ALL. 4 factors were identified predicting the outcome of ICH: low albumin, elevated LDH, age more than 60 years, and relapsed disease. 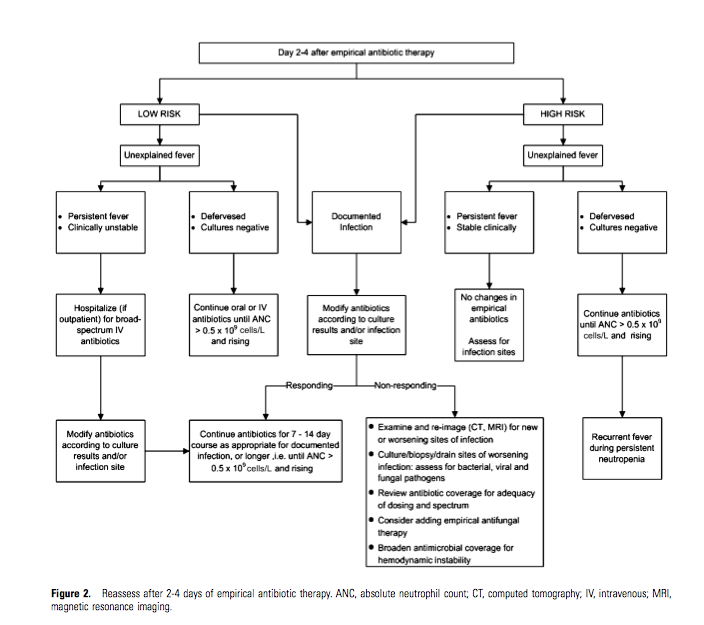 The most common presenting symptom is mental status change; and at the first such clinical sign, patients need to be monitored closely by repeat radiologic imaging (CT/ MRI). We maintain the platelet count more than 50 000/uL. 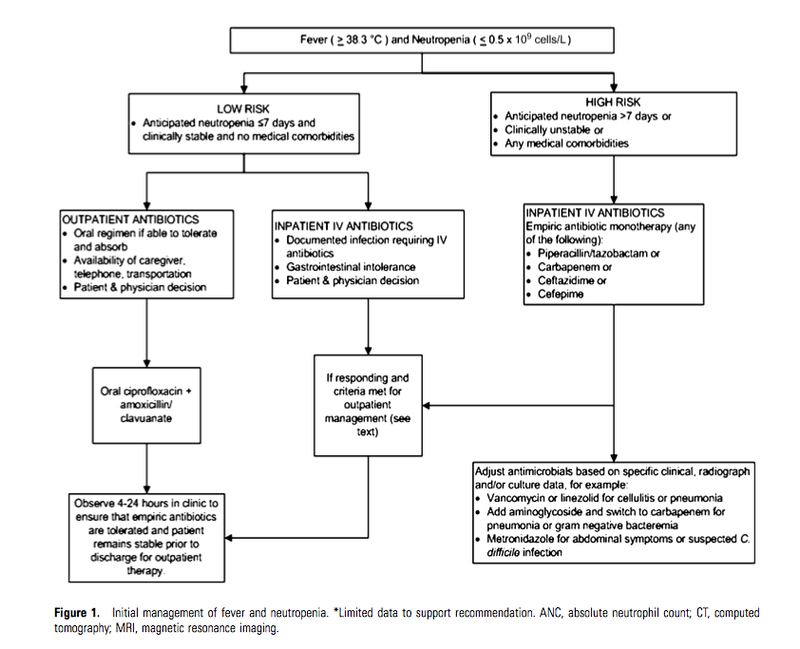 Early neurosurgical consultation is advised; and if ICH is firmly diagnosed, the platelets should be kept above 100 000/uL, if possible, and emergent neurosurgical intervention should be considered. 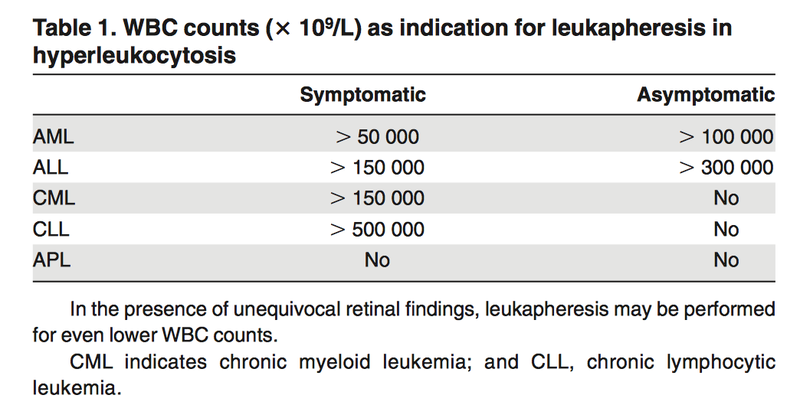 In AML, incidence at diagnosis or relapse is low (3%-7%). In contrast to ALL, where CNS prophylaxis is mandatory, it is unknown whether prophylaxis in AML can prevent CNS relapse. Among AML, high-risk APL are at higher risk of CNS infiltration. The pathogenesis of leukemic infiltration in CNS is unknown but involves interruption of tight junctions of the blood-brain barrier through adhesion molecules on leukemic blasts or increased permeability from vascular endothelial growth factor. An increased risk of CNS involvement in AML occurs with a high WBC, high circulating blast count, high LDH, and younger age. It is more commonly associated with inv(16)(p13q22), chromosome 11 abnormality, or trisomy 8. Monocytic lineage leukemias are also associated with a 5.7-fold increased risk of CNS disease. CSF study and MRI with contrast may be needed. MRI alone is neither sensitive nor specific enough to establish the diagnosis of CNS leukemia. Frequencies of gram-positive, gram-negative, and polymicrobial bacteremia were approximately 57%, 34%, and 9%, respectively. Although isolation of gram-positive organisms was more common than isolation of gram-negative organisms, gram-negative bacteremias were associated with greater mor- tality (5% vs 18%). Fluroquinolones reduce all-cause mortality and infection- related mortality and have been recommended in high-risk patients. Vancomycin is added initially only in cases of soft tissue infection, suspected catheter-related infections, in a hemodynamically unstable patient, or in a patient who is previous colonized with Gram-positive bacteria. A single blood culture positive or coagulase-negative staphylococci should generally be dismissed as attributable to a contaminant, assuming that a second set of blood specimens have been drawn that have negative culture results. ciprofloxacin monotherapy is not an adequate therapy for febrile neutropenic patients because of its weak activity against gram-positive organisms, especially viridans streptococci. In combination with vancomycin or clindamycin, however, it is a suitable alternative for patients who are allergic to b-lactams. The use of granulocyte transfusion does not improve survival.Although controversial, we often use daily granulocyte transfusions for deep-seated fungal infection not responding well to initial therapy. 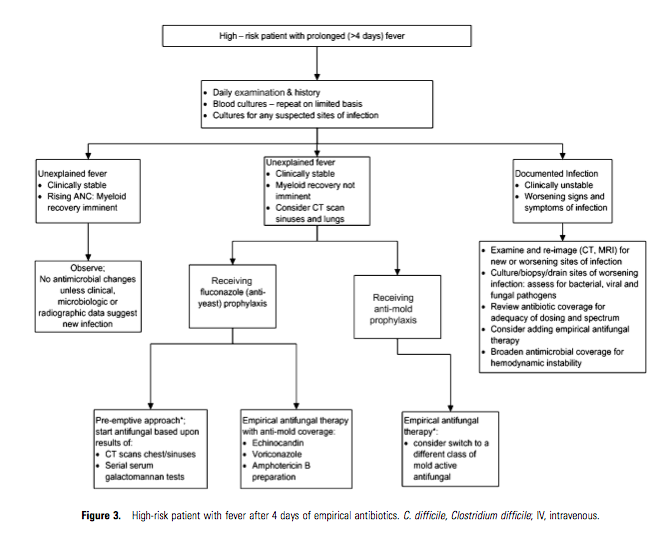 If fever persists after empirical antibiotics have been started, then 2 sets of blood cultures (via catheter or periphery) may be obtained on each of the next 2 days. Approximately 15% of patients have fungal organisms isolated in the blood, with Candida being the most common isolate. The pathogenesis of NE is linked to the damaged gastrointestinal mucosa. This is attributable to chemotherapy and neutropenia leading to intestinal dysfunction and microbial invasion with, secondarily, edema, inflammation, ulceration, transmural necrosis, and possible perforation. Abdominal CT is often useful. Most authors agree that bowel thickening more than 4 mm is a mandatory criterion for establishing the diagnosis of NE. A more than or equal to 10-mm wall thickening was associated with 60% mortality compared with 4.2% with less thickening. appendicitis, diverticulitis, and ischemic colitis. Although equally efficacious as daunorubicin, Adriamycin is never used in AML following a classic study in 1982, which demonstrated significantly greater incidence of NE with Adriamycin. Parenteral alimentation and nasogastric suction have not proven useful and are not used in our centers.89 Antibacterial prophylaxis with quinolones in high-risk neutropenic patients, as recommended in recent guidelines,86 is an appealing approach, although it is not known if the incidence is reduced. Keratinocyte growth factors, such as palifermin or repifermin, have been approved (palifer- min) for prevention of oral mucositis after intensive chemotherapy. However, no study has demonstrated a reduction in NE with keratinocyte growth factors, and they are not used for this purpose.